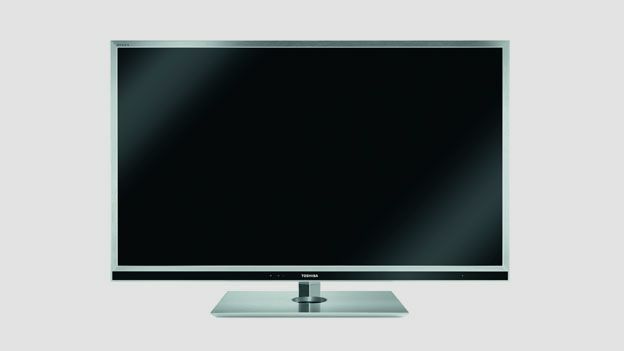 It's not just the brushed silver bezel which makes the Toshiba 46YL863 stand out from the crowd. The spec is head-turning too: active shutter 3D, connected net portal, USB media playback and recording. All modern life is here. The screen sits near the top of Toshiba's 2012 range, below the stratospherically expensive, glass-free 3D Toshiba 55ZL2 but ahead of the brand's RL858 models and alongside the WL range. Its nearest competitors are the Philips 42PFL7666, Samsung UE46D6530 and Sony KDL-46HX823. Active shutter 3D and Smart functionality are the key attractions on this fancy Freeview HD TV. Toshiba's dedicated net portal Places offers a goodly selection of free and subscription viewing, including Dailymotion, Box Office 365, Acetrax, Woomi and Cartoon Network. BBC iPlayer and YouTube are also provided, but they're not integrated into the net portal itself – they have to be accessed from elsewhere in the main TV menu. Unfortunately, for a Smart TV the 46YL863's media playback is disappointingly dumb. While all popular file formats play from local USB, across a network nothing beyond the odd MPEG offering and MP3 work. The cosmetic finish of the 46YL863 is a clear strength. Employing a brushed silver bezel, this 29cm thin model glints expensively. While we would have been more impressed by a totally seamless bezel, this screen clearly has catwalk chops. Connectivity is comprehensive. With four HDMIs, plus component, PC and Scart via adaptors, two USBs (one of which can be designated for external recordings), Ethernet, CI Slot, plus a digital optical audio out, most anything can be hooked up. Wi-Fi is integrated, helpful if you don't have a network switch handy. This set's high-def picture performance is brilliant, with caveats. Almost uniquely, Toshiba's Resolution+ image booster is able to naturally enhance detail, adding a subtle crispness to SD and HD content without inducing ringing artefacts or other nasties. Colour fidelity is also peachy. The screen makes a particularly good fist of glinting brass, never easy for LCD. Greyscale tracking may be a little tight, but dark sequences exhibit an inky smoothness and detail is held in shadow. As expected, both Active Motion 800 modes maintain 1080p clarity, stick to the Standard option has this comes with very few motion induced artefacts. Despite all this CEVO cleverness, the set's 3D performance is disappointingly average. While there's a good sense of depth to be had when you don the supplied glasses, crosstalk double imaging is rife. Normally there's only one Disney castle at the opening of Tangled, but on the YL863 there's self evidently two. With its eye-catching Jacob Jenson design and inherently sharp, vibrant high-definition images, the Toshiba 46YL863 is an LED screen that's comparable with the best of the competition. The user interface is slick and easy to navigate, and it hits all the right buttons when it comes to internet TV (there's BBC iPlayer, YouTube and Dailymotion on tap, plus assorted subscription services). Media playback from USB is also accomplished, and there's bonus PVR recording to external USB hard drives. Unfortunately, the set's 3D performance is relatively poor, thanks to copious crosstalk, and the wheels fall off the bus when you try and stream media files across a local network. Both of these shortcomings may well dampen your enthusiasm.